A little late on getting this posted, but wanted to get the word out about tomorrow’s Southend meeting for the Seattle 2035 Comprehensive Plan. The meeting is tomorrow (4/15) at 8pm at the Rainier Community Center (4600 38th Ave S). To find out more about Seattle 2035, see the quick description below and click here to head to the official site. The City of Seattle is in the process of updating our Comprehensive Plan for the second time. A major update like this happens every ten years and is focused on evaluating which aspects of the plan are working and what need to be adjusted. 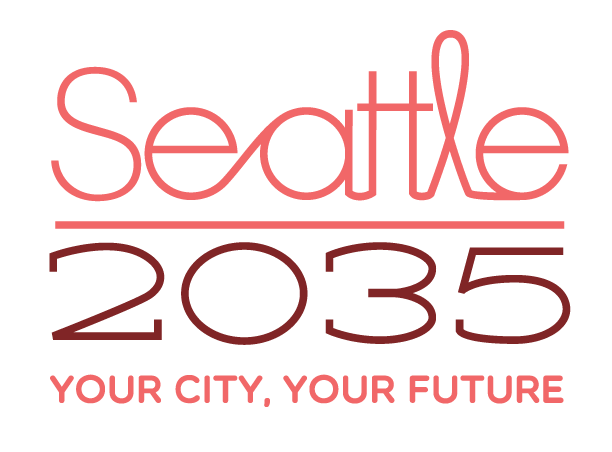 Seattle 2035 is the name of this update as we are looking towards how Seattle will grow over the next 20 years. As Seattle’s Department of Planning and Development, we are tasked with listening to the public, comparing growth scenarios, and presenting our recommendations to City Council for their approval in 2015. If you want to see something happen in Seattle over the next 20 years, let us know. Come to a meeting, write us an email or letter, or just write a comment on this website. This is the future of your city, be a part of shaping it. Why Do We Have a Comprehensive Plan? Seattle is growing and changing everyday. How Seattle grows creates a lasting effect on the environment, quality of life, and economy. Should we encourage suburban sprawl? A tall, hyper dense downtown? Or something in between? In 1994, Seattle’s first Comprehensive Plan was passed with the idea of creating Urban Villages. This strategy designated certain neighborhoods as Urban Centers or Urban Villages and encouraged new housing, jobs, and transit towards these centers. Our goal was to make neighborhoods where people could easily walk, bike, or ride transit to get to work, go out to eat, or buy groceries. By concentrating growth in this way we also were able to more efficiently provide services and proactively plan for the future. The Seattle 2035 update will look at current growth projections and present different scenarios to the public on how we can adapt the Urban Villages strategy to leverage growth to the benefit of the city. We will be looking at things like where Seattleites live, where we work, how we get around the city, do we have enough public services, are there equal opportunities for every community, and how to protect our environment. Growth and change are happening in Seattle. The Comprehensive Plan will leverage that growth to benefit the city as a whole and ensure Seattle remains a healthy, vibrant city.